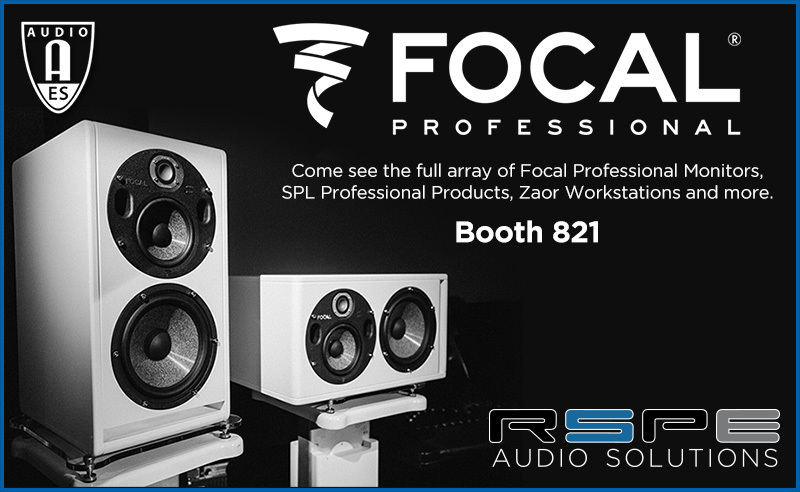 Visit RSPE and Focal at AES to Experience Focal Trio & ASC Attack Wall! Visit RSPE’s booth Featuring Focal Trio & ASC Attack Wall! Stop by Booth #821 to see the full array of Focal Professional Monitors, SPL Professional Products, Zaor Workstations and much more. The Focal Trio6 Be is a three-way speaker with a 1” tweeter, a 5” woofer, and an 8” subwoofer. Yet, much like it's older sibling the SM9, switching to FOCUS mode reconfigures Trio6 Be into a two-way monitor. This dual monitor is the new reference in its price range owing to its extreme neutrality, its precise stereophonic imaging, and its ability to resolve the most minute sonic details, while its Class G amplifiers deliver SPL levels to suit all musical styles. The ASC AttackWall a free standing, modular acoustic workstation that consistently produces the most amazingly clear sonic space you'll ever work in. The AttackWall produces a reliable, repeatable, and accurate sonic space in which to track, mix, and master, regardless of room or speaker system. The AttackWall is made up of Studio Traps and Monitor Traps, versatile acoustic tools created by ASC for the recording studio. The front half of the Studio Trap is treble range reflective and the back side is treble range absorptive. The entire surface of the Traps is bass range absorptive. Studio Traps are adjustable in height and are usually set up midway between the floor and ceiling, but they can be raised or lowered for different listening positions or line of sight requirements.